I didn't think pork chops and I were gonna be friends. The first time I tried making them they were SOOO DRRRRYY!!! Wow. It was not a pleasant experience. I honestly didn't even want to try making them again. Of course, they were so cheap that I still had 3 pork chops left in the freezer. I figured I'd try again. I am so glad I did! These were so good and juicy! 1. Season your chops on both sides with salt and pepper. 2. In a large pan, heat the olive oil and brown the chops on both sides over medium-high heat. Remove them and set them aside. 3. Add your pineapple chunks and coconut aminos into the same pan and let them cook up until they simmer. 4. 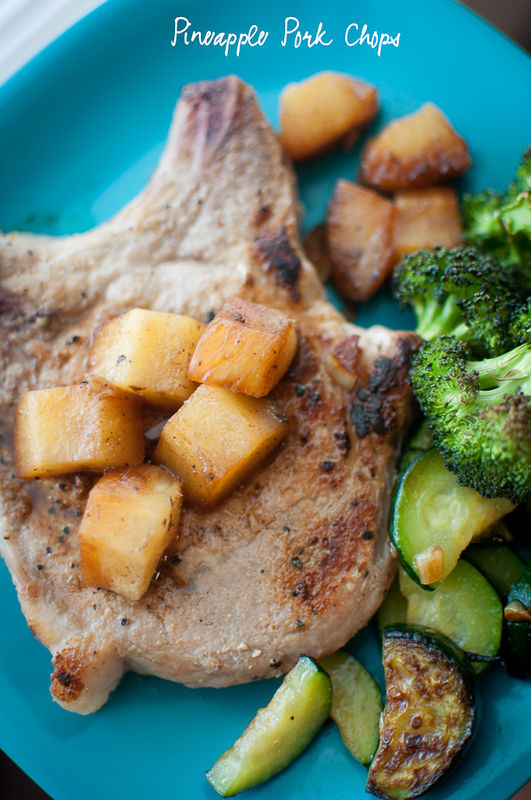 Reduce the heat to about medium and place the chops back into the pan right on top of the pineapple chunks. Let them simmer until the juices run clear. This is awesome! I'm looking for pork chop recipes for dinner tonight!